A Gmail update announced today will let you block specific email addresses from within Gmail. 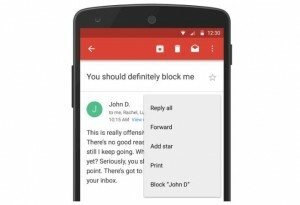 The update, which aims to put an end to annoying emails, is being rolled on on the web today and will be available for Android over the next week. The feature will send emails from blocked addresses straight to the spam folder, though users can always unblock an address in Gmail settings, should the sender promise to be less annoying in future. The ability to unsubscribe from mailing lists – already available on the web – is also being rolled out to Android.